Jobu reacts to Amar’e Stoudemire’s huge blunder in Miami. Because I had Amar’e Stoudemire and Jeremy Lin on my fantasy team this season (before both got hurt), I ended up watching almost every Knicks game I could. I won’t say that I became a Knicks fan, as I have and always will root for the Celtics (I know that’s weird for a Yankees/Giants fan to say), but I definitely found myself wanting them to do well all season long. I’ll be honest, I have not been watching the playoffs, but I’m kind of glad, especially after what Stoudemire did Monday night. What did he do, you ask? 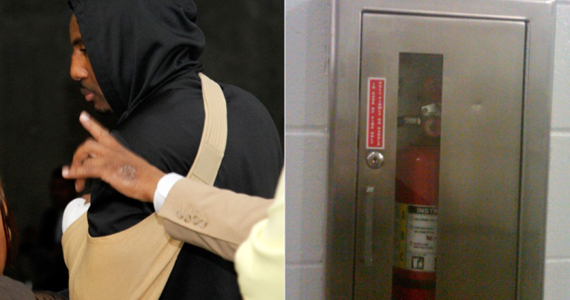 Frustrated after another loss (Knicks are now down 2-0 to the Heat in the series), Amar’e apparently punched a glass case containing a fire extinguisher on his way back to the locker room. The glass shattered (because it’s frickin’ glass) and cut Stoudemire’s hand. While the extent of the damage isn’t fully known, the big man was seen leaving the arena with his arm bandaged and even in a sling. Granted, the Knicks medical team was probably taking every precaution, but that’s no good any way you look at it. Although most Knicks fans and reporters are probably unleashing tirades both on paper and into the air we breathe right now, I understand what Amar’e did. Everyone of us has probably kicked, punched or hit something in anger of frustration. That happens. The fact that he punched something made of glass makes this a little dumber than most incidents, but he probably just hit the first thing he saw. I once accidentally put my hand through a pane of glass because i was angrily trying to open a door. Now, I was like twelve, and I wasn’t getting paid $100MM to play basketball, but accidents do happen. I mean, a similar temperament issue may cost my Celtics game two of their playoff series as well. Rajon Rondo was ejected towards the end of game one against Atlanta, and is now suspended for game two, because he lost his cool and chest bumped a referee. I feel like, although Amar’e’s transgressions will probably cost him more time than the chest bump will cost Rondo, the chest bump is by far the worse of the two offenses. You don’t touch officials. Ever. In fact, when you want to hit an official, you should probably hit an inanimate object (not made of glass). It will be interesting to see if the Knicks can recover from the loss of Stoudemire. Not too many people even gave them a chance against the Heat to begin with, but could losing Stoudemire actually help them? The Knicks were 14-5 this year with Stoudemire out, although Lin wasn’t also hurt at the time. Perhaps they gel better with Stoudemire off the court, or perhaps the rest of the team just got hot when he was out of the lineup. Personally, I think this team will falter without Amar’e in the playoffs. It happened last year, when Stoudemire hurt his back… while attempting a dunk in practice (sigh… not a game. not a game. practice! We talkin’ ’bout practice, man!). I mean seriously… come on now. Either way, I don’t think the Knicks were beating the Heat this year. Lebron, Wade and Bosh are too good together right now, and the rest of the team is pretty underrated and stacked too. Unfortunately for the Knicks, now they might not even win a game in these playoffs (overall the Knicks have lost 12 straight playoff games as a franchise). 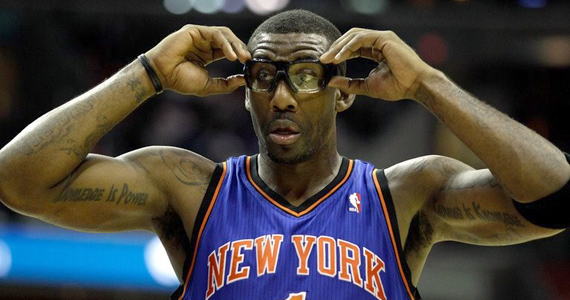 We understand what you did Amar’e, so it’s hard to be too upset, but geez. Punch a pillow next time!